Features an audio read-along! Ike wants to write a story, an incredible story. He’s all ready to go, but even after cleaning his room and calling his best friend, he somehow can’t seem to get started. And then Ike realizes what’s missing — he needs new ink. His very own ink, made from just the right ingredients. Now what can Ike find that is velvety, dark, and sneaky, just like ink? How far will he go to get it? 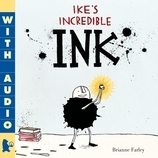 In Brianne Farley’s whimsical debut picture book, freely illustrated in a fresh, bold collage style, Ike’s adventurous quest to find the perfect ink might just be the inspiration he needs to get started on his incredible story.